A substantial account of the Western Canadian Lubiniecki family, from which we draw heavily and which we recommend for an account of the recent generations of the family, has been given in Harvest of Memories: Sturgis and District …, 1900-2000, by the Sturgis and District History Book Committee (Sturgis, Saskatchewan: the Committee, 2000), 518-21. A related page on this site is our Ancestor table of the children of Leo James Lubiniecki and Alma Cecilia Reagan. The original spelling of this name was Lubieniecki, which although rather uncommon is well evidenced in Polish records. The place from which our family came, Jazłowiec (now Pomortsy, 48.9670N, 25.4330E), originally in Poland, was part of Podolia, Galicia, Austria throughout the nineteenth century and up to World War I, after which it was ceded to Ukraine. The name Lubieniecki is attested at Jazłowiec so early as the 1720s, when a Joannes Lubieniecki is mentioned in property transactions. However, the known pedigree of the present family begins much later with Anton(ius) Lubieniecki, born in the middle of the nineteenth century. The present compiler, who is descended patrilineally from this Lubiniecki family, had an intensive genetic test performed by FamilyTreeDNA which determined that this lineage belongs to the I-A16863 haplogroup. This haplogroup, according to the site, “is found distributed in the Balkans and Eastern Europe, and extends further east with Slavic-speaking populations.” Shortly after the completion of the test we received and accepted an invitation to join the organization’s Polish Project, where the results may be seen. Anton was born in Jazłowiec, which was under Austria-Hungary at the time. He did the required military service (age 18-28) and then married Mary Nyczek who was the only child from a well-to-do family. Mary lost some children in childbirth and infancy (Julian’s twin for instance) but four survived to adulthood: Marian, Mary, Julian, and Leona. They lived in town where Anton had a business — something to do with wheels for carts, carriages and the like. Due to economic misfortunes and the promise of a good life in Canada, they decided to make the move. Marian would not have been allowed to leave, however, as he was approaching the age of conscription, so masqueraded as a nobleman and left the country. He went to Hamburg and waited there to reconnect with his family (i.e. Julian and their parents — not sure about the girls). They sailed to Halifax harbour and were in quarantine for three months before making their way out to the Dauphin area. And indeed, while the record does not state the date of embarkation, “Antonie Lubinikie,” aged 54, together with his wife and four children, sailed from Hamburg on the Pisa, arriving at Halifax, Nova Scotia, on 23 May 1898. This is the last will and testament of me Antoni Lubinicki [sic] of the town of Dauphin in the Province of Manitoba, I hereby revoking all former wills. I devise and bequeath and appoint all the real and personal estate which I am seized or possessed of or entitled to … to my wife Mary Lubinicki and appoint her the sole executrix of this my will. He made a mark in lieu of a signature. The estate, proved on 26 November 1918 by the widow, “Mary Lubinicki,” was described as consisting of a property on Lot 11, Block 50, Plan 226, Dauphin, assessed at $300. 2Marian Lubiniecki, born about 1878 (aged 19 in 1898, 28 in 1906) in Austria. 3Julian Lubiniecki, born 7 July 1880 (?). Maria Lubiniecki, born 1884-85 (aged 13 in 1898) in Austria, alive on 16 September 1962, when she named as a surviving sister, “Mrs. Marianna Gresgow, Windsor, Ont.,” in the death notice of her brother Julian. As Mary Lubiniecka she married 21 May 1905 at Winnipeg, Peter Greskiw. 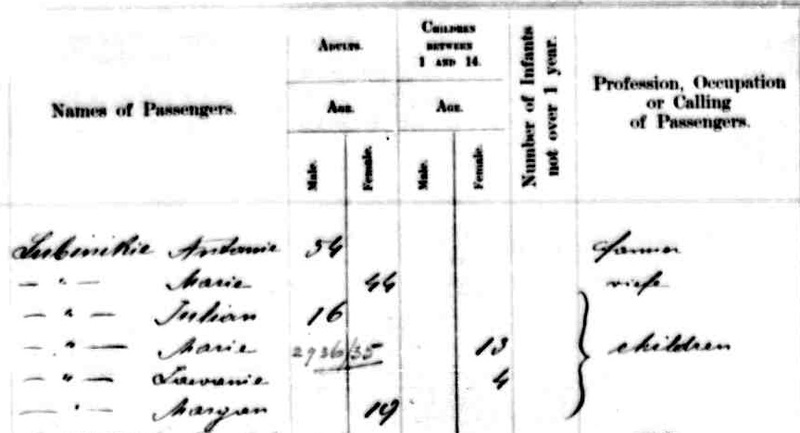 We have not found this couple in the 1906 or 1911 census. Leonie Lubiniecki (female; name illegible), born 1893-94 (aged 4 in 1898) in Austria; no further record found. She is not named as a survivor in the death notice of her brother Julian. Early in her life Sister Adeline was moved by love for God and the Eucharist and wanted to become a Sister. After graduation from Dauphin Collegiate, she entered the Benedictine Monastery in Arborg, Manitoba, on December 8, 1926, and made her monastic profession in 1928. Sister Adeline received her R.N. from St. Joseph’s General Hospital, Winnipeg, and nursed with great gentleness and care in hospitals in Oakes, North Dakota, Russell, Birtle, Winnipegosis, Gimli, at the Arborg Manor, and the Monastery Health Care Centre. She retired from active ministry in 1975. Sister Adeline was a woman of few words…. Sister loved to write poetry and would occasionally gift another sister with a poem written just for her. Prior to her Golden Jubilee she expressed deep gratitude for the encouragement she received from the other sisters…. Sister Adeline was predeceased by her parents and all her siblings, Emil, Louis, Anne Rowell, Lill Gregorash, and Frank. She is survived by her niece Vicky … in Winnipeg; nephews, Tony [Lubiniecki] in Dauphin and Lorne in California [this must be a mistake for her nephew-by-marriage, Lorne Blair]; and sister-in-law Ann [widow of Louis Lubiniecki] in Winnipeg. 4Emil (“Mel”) Lubiniecki, born 1904 in Manitoba. Ludwig W. Lubiniecki (known as Louis in adulthood), born 10 August 1905 in the Rural Municipality of Gilbert Plains, Manitoba, died (without issue) 18 March 1982 at Oakview Nursing Home, Winnipeg. His middle initial is known only from his mother’s death certificate. He married (as her second husband) Ann Negrych, born 28 September 1918 in the Venlaw District in the Rural Municipality of Gilbert Plains, Manitoba, died 20 July 2000 at the Dauphin Regional Health Centre, Dauphin, Manitoba, and buried in Chapel Lawn Memorial Gardens, daughter of Sam Negrych, by his wife Pauline Hrechka. She was the widow of Michael Bomak, by whom she had two sons, William and Robert Bomak, and two daughters, Rosemarie Bomak (Mrs. Frank Tabak), of Gilbert Plains, and Pat Bomak (Mrs. Grant Reynolds), of Wawanesa, Manitoba, later of Winnipeg. Louis Lubiniecki moved to Winnipeg, where, according to his death notice, he “was employed with the City of Winnipeg Engineering Department until his retirement in 1971.” The 1972 death notice of his brother Frank speaks of him as of St. James (now a suburb of Winnipeg). He and his wife were members of St. Basil’s Church, 202 Harcourt Street. They had no children together. Josephine (“Josie” or “Jo”) Rowell, of California, alive in 2009. She married Lorne Blair. Victoria (“Vicky”) Rowell, of Winnipeg in 1998; alive in 2009. She married (1) (but subsequently divorced) Brian Fijal. She married (2) Bert Blair. Kenneth Gregrash; married Helen Phyllis Horodycki. They are living at Winnipeg (2004). Shirley Gregrash; married Henry Wiebe. They are of Winnipeg (2004). Lorraine Gregrash; married James Barlow. They are of Victoria, B.C. (2004). Frank Lubiniecki, born 1919-20, died “suddenly” and without issue 17 September 1972, aged 52 years, and buried in Transcona Cemetery, Transcona (now a suburb of Winnipeg). He married (1) ________. He married (2) (as her second husband) after 1964, Helen Mary (Juras) Miller, born at Winnipeg, died 25 April 1979 at the Health Sciences Centre, Winnipeg, and buried in Corpus Christi Polish Roman Catholic Cemetery, Narol, St Clements RM, Manitoba, widow of Stanley Miller (who died 1965). His niece, Lorraine (Gregrash) Barlow, writes: “Frank had two brief marriages many years apart, with no children.” At the time of his death he was living at 342 Whittier Ave., Transcona. Named in his death notice is a “daughter” (actually step-daughter) Margaret, wife of Morris Lucko, of Winnipeg. 3. Julian Lubiniecki, son of Anton(ius) Lubiniecki and Maria (or Mariana) Nasadnik or Nyczek, was born 7 July 1880 (?) at Jazłowiec (now Pomortsy) aforesaid, and died 16 September 1962 at Regina, Saskatchewan, aged over 82 years (see death notice, quoted below). He came to Manitoba (apparently with his family) possibly so early as 1897 (as claimed in the entry for him in the 1906 census), and certainly by 1901, when as “Julian Lubinickie” he is enumerated in the census of the town of Morton, near Brandon, as a domestic servant in the household of a George Armstrong; this source states his birthdate as 7 July 1881 but his “age at last birthday” as 20, which is contradictory, and gives his year of immigration (wrongly) as 1895 and his annual income as $300. He was naturalized in 1905. He married 15 May 1904 at Winnipeg, a few weeks before her fifteenth birthday, Kateryna Demchuk, born and baptized 3 June 1889 at Cyhany, in the Borshchiv district, Galicia province, Austria (formerly part of the Ukraine), died 24 May 1945 at Sturgis, aged over 55 years (see death notice, quoted below), daughter of Wasyl (“William”) Demchuk and his wife Antonia Worowy, who afterward settled near Dauphin. The Lubiniecki family has correctly preserved her birthdate of 1889, which agrees with the statement in her marriage certificate that she was 15 years of age at the time. It is however reported incorrectly in a number of sources. The death of Mrs. James Lubiniecki occurred at her home in Sturgis, Sask., on Thursday, May 24 . A private funeral service was held in Sturgis, with Father Thos. S. Novak, O.M.I., officiating, after which the body was forwarded to Dauphin, where services were held in Bullmore’s funeral chapel, with Rev. Teply officiating. Interment was in Riverside cemetery. High mass was held in the Greek Catholic church in Dauphin after the funeral. Pallbearers were: Steve Demchuk, Tom Demchuk, Tony Demchuk, Alex Demchuk, Bill Danilyshan and Nick Balan. Fifty-seven years of age, Catherine Demchuk was born in Ukraine. Coming to Canada in 1897, she took up residence in the Sifton district. She was married in 1904 in Valley River to James A. Lubiniecki and moved to Gilbert Plains. Mr. and Mrs. Lubiniecki came to Dauphin in 1910 and moved to Sturgis in 1930. Surviving are her husband, her mother, Mrs. Wasyl Demchuk, of Sifton, two sons, Leo J. Lubiniecki, Sturgis, and Tony F., of Toronto, and two daughters, Mrs. Wm. Henderson, of Whitemouth, Man. ; and Mrs. J. A. Hilts, of Whitewood, Sask. ; and six grandchildren. There are four brothers and four sisters: Steve Demchuk, Dauphin; Alex, Tony, and Tom, all of Sifton, an; Mrs. Mike Trush, Sifton; Mrs. M. Buyar, Ethelbert; Mrs. B. Blahitka, Windsor, and Mrs. B. Danilyshan, Grandview. Julian Anthony Lubiniecki, former resident of the Keld district, passed away in Regina, Sask., Sunday, September 16 , in his 83rd year. Funeral services were held from the Ukrainian Catholic church and at the Sneath-Strilchuk funeral chapel, Dauphin, with Rev. Dean G. Oucharyk officiating. Internment [sic] took place in Riverside cemetery. Born in the Ukraine, Julian Lubiniecki came to Winnipeg in 1903 and two years later moved to Keld, and in 1910 he came to Dauphin and was employed as a carpenter until 1930. At that time he moved to Sturgis and in 1945 went to Regina to follow his trade until he retired in 1955. He married Katherine Demchuk in Sifton, who predeceased him in 1944. Surviving are two sons and a daughter: Leo J., Sturgis, Sask. ; Tony F., Montreal, Quebec; Mrs. Verne Hilts, Roundup, Montana, USA; a sister, Mrs. Marianna Gresgow, Windsor, Ont. ; 12 grandchildren. Josef Lubiniecki, born 22 January 1905 at Gilbert Plains, Manitoba, died before the taking of the 1911 census. 5Leo James Lubiniecki, born 4 July 1907 at Dauphin. Gail Henderson, a bank clerk; married Clarence Pischka, a bank manager. June Catherine Henderson, a teacher; married Brian McDougald, a mechanic. They have at least one child. Natalia Lubiniecki, born 18 July 1910 in the R.M. of Gilbert Plains, Manitoba, died by 1919, when another daughter was given the same name. Tina Lubiniecki, born 1912, died 2 July 1915 at Dauphin. Joseph Alfred Hilts, Jr., born 7 May 1941 at Walpole, Saskatchewan, living 2000. He married 21 June 1969, Margaret Hylck, a school-teacher, daughter of Ed and Rose Hylck of Freen Bay, Wisconsin. He is a U.S. Foreign Service officer who had many African postings, including Burkina Faso (1994-95) and Dar Es Salaam, Tanzania (1996-97). He now (2000) works at Washington, D.C. Issue: Aaron, Adrienne. Elizabeth Anne Hilts, born 1942, died 1988, who was an accountant librarian for Saskatchewan Wheat Pool in Regina. He graduated from the University of Wyoming where he met his wife, Cheryl “Cherie” Lang. They were married on September 9, 1967. They then moved to Missoula, Montana, where he graduated first in his class from the University of Montana School of Law. John excelled in baseball and set several pitching records at the University of Wyoming. He then pitched professionally in the Baltimore Orioles organization in California and Florida. One of his joys was coaching and he was the pitching coach for the Medford Mustang American Legion Baseball team when they won their first state championship in 1975. He was a skilled and respected attorney and practiced in Oregon, Nevada, California and Montana. In addition to training with Gerry Spence in Jackson, Wyoming, he and his family spent four months in Europe and Scandinavia in 1982 while he studied International Law. Although the majority of his active law career was spent in Medford, he was practicing in Las Vegas, Nevada, for the last nine years. John … played Medford City League Basketball for many years…. He ran in four marathons (Sacramento, San Diego, Santa Barbara and New York) in addition to several Pear Blossom runs…. He became a pilot in the 1980s and flew small planes. He was also a gifted musician and was invited to appear on the Lawrence Welk Show when he was in eighth grade. Everyone knew him to be an entertaining storyteller and he wrote two unpublished books. In the past several years his hobby was collecting and running model trains. In addition to his wife, he is survived by his son, Dr. Michael John Hilts and wife, Julia, of Greensboro, North Carolina; daughter, Julie Lenore Cromwell and husband, Mark; and son, Ryan Leigh Hilts and fiancee Kelsey Chance, all of Medford; mother, Verne Hilts of Wisconsin; brother, Joseph Hilts and wife, Margaret of Green Bay, Wisconsin; brother, E.J. Hilts and wife, Pamela of Las Vegas, Nevada; and granddaughters, McKenna, Marlena and Madara Cromwell and Rachel Hilts. He was preceded in death by his father and sister Elizabeth…. Arrangements Hillcrest Memorial Park & mortuary. Medford, Oregon, 97504. Dr. Michael John Hilts, of Greensboro, North Carolina, a family practitioner, who graduated in Medicine from the Unversity of Utah in 1995. He married Julia ____. Julia Lenore Hilts; married Mark Cromwell, of Medford. Ryan Leigh Hilts, of Medford; engaged at the time of his father’s death to Kelsey Chance.